« I don’t want to. I normally blank out names, but its a <20 scub alt, I’m not going to ruin his reputation. 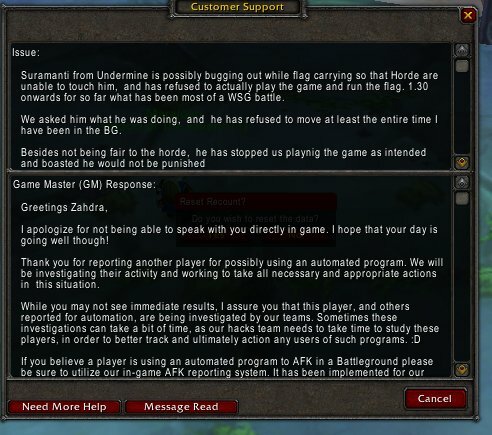 I came in a few min into the BG – Surumanti had the flag somewhere in the horde base, most probably somewhere bugged where no one could get to him because the horde never got close to touching him damage wise. 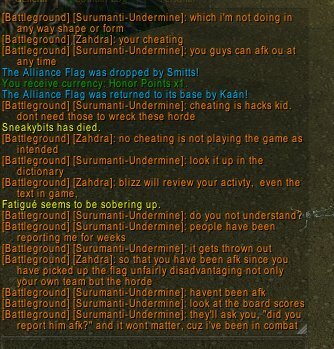 We asked him what he was doing, because we noticed he wasn’t moving, and then till the end of the bg he stayed there, holding the flag arguing with his own team about the finer points of what is cheating in a game. He honestly thought he was doing an ok thing. The sadder thing is he is probably right in that he will not get punished. 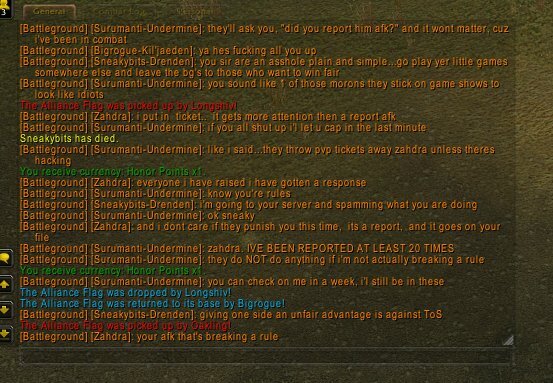 “I have been reported at least 20 times” he said – and he is still playing – still holding peoples game time to ransom. You cheat someone financially – its a crime. This isn’t playing bad or gemming wrong. It’s vindictive, and deliberate. This is somewhere someone sitting at his pc finding amusement in holding 19 other peoples 20 min of game time hostage to his joy. So how do you punish someone like that. Don’t let him queue for BG’s. If he does it in Pve, don’t let him queue for dungeons. Take away the power he has to control 19 other peoples game time. Some people left, and would have been punished by not being able to queue for a BG for a set time. They would have been punished for being the victims, not the person committing the offence. 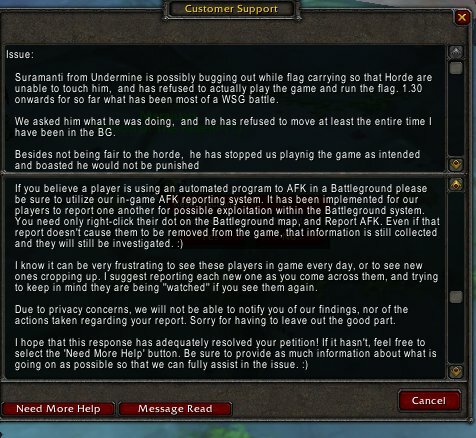 If they can ban people from forums for posting inappropriate things, why not ban them from posting things in chat, from queing for a bg, or a dungeon. Edit: A Standard response received. Holding other 4, 9, 24, 9+10, 14+15 people hostage for his own amusement is common in randomly generated teams. He isn’t more destructive than the guy who do less damage than the healer. He is more obvious and more open: instead of being “new to the game” he openly says “i can do whatever i want”. You can either completely avoid random environments or try to strike back. This case I would queue to BGs until you play with him again. Follow him from the start, figure out his bugged way. Then create a horde alt on his server and kill him in his bugged paradise. Anyone wasting my 30 min of my time, for what I can only assume is for their own sick pleasure and “making a point” of some sort would make me angry. Whether in RL or in a video game. I don’t think it means she’s had too much WoW, I think it just means she’s had too much asshattery. I probably meant scrub urgh…. what are you complaining about? he takes all the risk so your team can’t lose the battle. get a grip and profit by all going to get the horde flag -> end that pvp sooner. if horde cooperates that battle would be over after 3 minutes and you could go back to one of the ‘fair’ losses by the hand of random idiots. All the risk? What do you mean? I’ve been on the horde side of this glitch, and it’s no fun. There is a place on the outside of the flag room, near the GY where Alliance can place themselves where no Horde can reach them. In this case, and correct me if I’m wrong, the Alliance FC was just standing in this zone. Rather than running in to cap the Horde flag when the Alliance flag was returned to it’s base, the FC just sat there, bantering in BG chat. his risk of being punished obviously. so you’re on the horde side of this? fine, go afk and let ally win -> 3 min of frustration and some fast honor vs 25 min of frustration and the same honor. If the ally do not cap the flag, then the match will last 25 minutes and end in a 0-0 tie. I will earn next to nothing honor. If I do choose to AFK (or spirit form AFK) during this time I run the risk of being marked AFK by a teammate and then recieving no honor and having a deserter debuff. So at very minimum I’m having to wait out the 15 min debuff to join another BG. So I’m either earning like 20 honor for a 25 min wait (where I can do nothing else in game) or I’m getting no honor and having to wait 15 min to requeue. It leaves no positive choice. If this happened to me in a game again, I’d just hope we’d have a DK on the team that could attempt to death grip out the flag carrier, or hope enough people would leave the BG that we could rotate one in. I enjoy PVP and BG’s for the game of it, not just to get the most honor/min for my time logged in. I’d be the one out there still attempting to heal my teammates. Its a matter of playing fair. You enter a bg and expect a fair game. Not someone monopolizing and other wise prohibiting normal game play. The sad part here is that you only got a boiler plate response from blizz. I have not confidence that they really read any thing any more. I had a character name completely scrambled during a transfer not long ago. I can’t get any response from them as they think the second scramble they made “corrected the issue”. The only place I have ever gotten a personalized and specific response from tech support is SOE in EQ2. Blizz, please make a /ignore for BG’s so I never see him again.